Department of ORAL AND MAXILLOFACIAL SURGERY, IGIDS, Department of ANATOMY and Department of PLASTIC SURGERY, MGMCRI jointly organized a HANDS-ON WORKSHOP in RECONSTRUCTIVE MAXILLOFACIAL SURGERY in cadavers on 5th April 2019 at MGMCRI. The resource person was Dr. Amol Dhopte, an eminent plastic and reconstructive surgeon from Nagpur and Dr.Meghana S Bagalkotkarfrom MGMCRI. 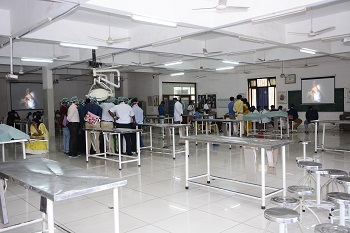 There were two scientific sessions followed by a demonstration of all the flaps for reconstructing maxillomandibular region by both the resource persons. During the afternoon session, the participants were allocated into convenient groups and were given HANDS-ON experience in harvesting various free and pedicle flaps. The participants were from Chennai, Vellore, Trivandrum, and Trichy. Online feedback was obtained and analyzed. Overall the feedback was “The workshop benefited them considerably”.